Why Are My Juniper Trees Dying? When to Plant Juniper Bushes? You have many options when choosing a type of juniper (Juniperus spp.) to grow--after all, over 170 types of junipers exist. Upright varieties, like the Armstrong or Arcadia varieties, are grown as shrubs while prostrate varieties, like the San Jose and the Andorra, grow close to the ground and make for a hardy ground cover. Whatever juniper you choose, fertilize the plant regularly to ensure healthy, vigorous growth all year. 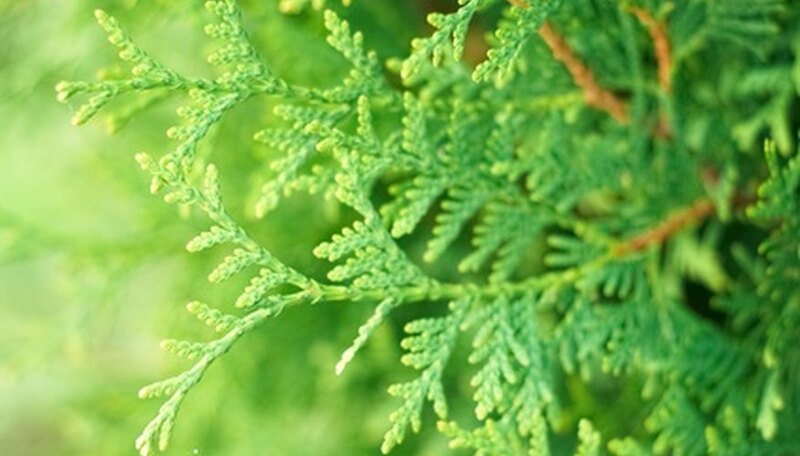 Fertilize the juniper shrub when you plant it. This gives the juniper the jolt of energy it needs for quick establishment. Mix 2 tsp. of 10-10-10 all-purpose garden fertilizer into the soil around the planting location, according to the University of Georgia. Feed the juniper shrub again in the early spring. For the best results, use a complete fertilizer labeled for use with shrubs. The University of Georgia recommends a 12-4-8 or 16-4-8 product. Apply 4 oz. of fertilizer in the 50 square feet of soil surrounding the juniper plant. Water the fertilized soil lightly to help carry the fertilizer nutrients into the ground. Apply enough water to moisten the ground to a depth of 3 to 4 inches. Repeat the fertilization process at the end of summer. Junipers are commonly injured by under- or over-watering. In addition, they are prone to Cercospora needle blight, Phomopsis and Kabatina tip blights, and canker diseases, among others. Over-watering and under-watering results in dry yellow or brown needles that fall to the ground. Cercospora needle blight is characterized by needle browning, needle drop and a buildup of fungal spores on dead needles. Phomopsis tip blight and Kabatina tip blight cause identical symptoms: new foliage turns dull brown, and then ashy-gray and spore-filled lesions form on branch tips. Diseases such as Botryosphaeria canker create elongated sunken areas on the stems and upper trunk, killing the upper portion of trees. Plant junipers in well-drained locations. Water the plants as needed to maintain vigor and health. Prevent Cercospora needle blight, Phomopsis and Kabatina twig blights by spraying with an appropriate fungicide before infection occurs. Remove cankers from infected trees during late spring or winter, and avoid pruning or shearing during the early summer months when spores are most active. Not only do seedlings lack color, a young juniper tree is unable to produce berries. These purple and black berries attract colorful birds and other wildlife. To enjoy this benefit of the juniper tree, the tree must grow to maturity. Juniper trees take up to three years to produce full, lush leaves and berries. A common juniper will grow at a rate of about 4 to 8 inches per year. A Spartan juniper is much larger and grows at a rate of 10 to 18 inches per year. The Compressa juniper grows to a height of only about 32 inches, according to the American Horticultural Society. A Spartan juniper grows up to 15 feet tall. Blue Point typically grows to be about 12-feet tall, with a spread of about 8 feet. The tree has a dense, pyramidal or conical form and a narrow trunk with brown, shredding bark. Blue Point has wedge-shaped, light green needles that mature into diamond-shaped, scaled leaves. Foliage has a strong, often unpleasant aroma that often repels common animal pests such as deer. Chinese juniper is native of Mongolia, China and Japan, though it is commonly grown as an ornamental or landscape plant in both North America and Europe. Often grown as a specimen or Christmas tree for lawns, this shrub may also help frame an entryway or walkway, or to act as a windbreak. Blue Point juniper requires full sunlight to truly thrive, although other Chinese junipers prefer partial shade. Blue Point juniper is adaptable to a wide range of soils, and is not picky about soil pH. The shrub will suffer in poorly draining soils. Water regularly, especially when the plant is young. Regular watering helps to establish a healthy, deep root system. Reduce water after plant is established, and during the winter. Fertilize annually before new growth emerges in the spring. 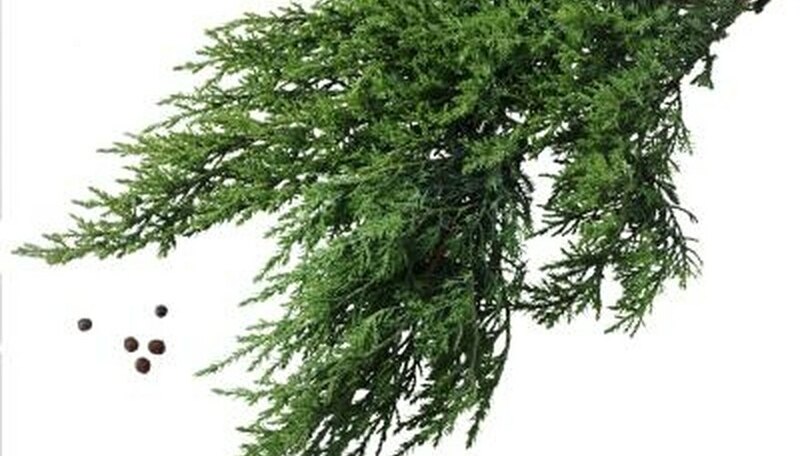 Chinese juniper is generally tolerant of wind. Voles and juniper webworm may both become a problem for the Blue Point juniper. Reduce voles' burrowing by applying a 2- to 3-inch layer of mulch, and remove nearby dead grasses and perennials because these may provide shelter for the rodents. Juniper webworms feed on foliage and leave telltale silky threads. Remove webworms by releasing natural predators or using a systemic insecticide. Rust is a common fungal disease that may be treated with fungicide. Check your juniper for dead, diseased or damaged branches. Diseased or damaged branches will show scars, cuts, bruising or discoloration. Dead branches won't move with the wind and will feel hollow. This wood needs to be removed for the health of the tree. Prepare a sanitizing solution by mixing 1-part bleach with 10-parts water in a bucket. Place your pruning tools in the bucket. Then cut off the unhealthy wood at its intersection with the trunk or with a main branch. In between every cut, place the tools back in the sanitizing solution to cleanse. Trim back the overall size of the plant by shortening long limbs. The University of Missouri recommends pruning juniper branches back to a Y-intersection to promote a more compact juniper. Cut down the juniper's height by 20 percent if you feel the tree is too tall. Prune back the top branches and outer branches. The best time to plant juniper bushes is in the fall, according to This Old House. Junipers can grow well in poor soil as long as they get full sunlight, according to the North Dakota State University Extension. Once you put your juniper shrub in the ground, you must water it each week if there is no rain. Once the ground freezes for the winter, you no longer need to water your juniper bush. Mulching heavily in the late fall will help your juniper bush live through a heavy freeze. However, once the winter passes, remove most of the mulch. Otherwise, it may stunt your bush's growth. Pick juniper berries from the tree carefully. They break easily, and once the oils are released, their flavor degrades quickly. Dry the juniper berries by spreading them out on a flat surface in a sunny spot until they are shriveled. 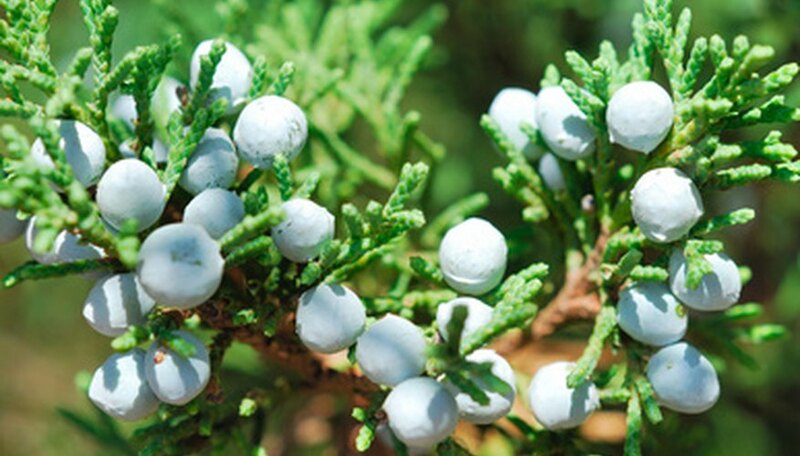 Store your harvested juniper berries in an airtight container and use them within one year. Remove new growths from the top that are taller than the main body of the juniper shrub, using hand pruners. Cut the stems near the dormant bud closest to the main body of the plant. This encourages compact growth. Trim outer stems around the outside of the shrub with hand pruners. Carefully cut the tips back so that new growth covers the cuts. Remove dead branches and secondary leaders with a pruning saw. Make cuts close to the main leader or the branch. Cut just above the dormant bud closest to the main body of the plant. Watch for the juniper berries to ripen. Ripe juniper berries will be dark blue and plump. Squeeze a berry between your fingers. If it squishes easily, the berries are ripe and ready to be picked. Pick each berry individually from the tree and place them in a basket. Wash the juniper berries in warm, soapy water before eating them. Rinse them well with cool water. Use juniper berries as soon as possible after you collect them for the best flavor. For an evergreen groundcover in full sun to partial shade, plant low growing Juniperus horizontalis. It even works well to control erosion on the slopes and rugged hillsides in Vermont. Space the plants about 3 feet apart in all directions and mulch to control weeds between the plants until they grow enough to fill in the area. It will soon grow to form an evergreen mat about 18 inches high. A rugged, forgiving evergreen, common juniper (Juniperus communis) will grow in the poorest soils and even thrive in Vermont's alkaline soils, although most evergreens prefer acid soil. Common juniper grows about 3 feet high and grows best in well drained soil that is on the dry side. Prune them yearly in early spring as needed to maintain their shape. Disease resistant and upright growing, Keteleeri Chinese juniper (Juniperus chinensis 'Keteleeri') grows to a height of about 30 inches. It has a dense growth habit and produces a large number of berries, which attract birds. Chinese juniper is hardy through USDA zone 3 and will grow well in the colder northern areas of Vermont. Pour the seed starting mix into a seeding flat to within 1/4 inch of the rim. Water the soil well, allowing the excess water to drain from the tray. Push the seeds into the soil so that they are 1/2 inch deep. Place the seeding flat outside to overwinter. Check the soil periodically. It should remain moist, but not wet. Move the seeding flat into an area where the seeds will be protected from squirrels and other critters in the spring. Keep the soil moist. Some of the seeds may begin to germinate, but most of them will need one more winter outdoors. Juniper berries begin green and become bluish black when ripe. There is a flowery scent and bittersweet piny flavor. Dried berries are still soft. Berries can be pureed, dried or crushed. A little goes a long way in that 1 tsp. of crushed berries can serve four persons. Store in an airtight container in a cool location. Juniper berries can flavor game or pork. They mix well with spices such as sage and bay leaves. Other uses include in marinades, home pickling or fruit dishes. Green fruits have been used for urinary tract issues, kidney problems and maintaining blood pressure. Juniper berries have antiseptic properties and are used for treating infection. They can also reduce congestion in the common cold. Juniper berries were an early medicine and have a mention in the Bible. Renaissance medicine men used them for plague, pestilence and snake bites.